Morning.... Hope you all have had a great weekend. I'm back today with another LOTV card for you and this time its a shaker card. I have used a fairly new image, Oliver - Driving Test and fussy cut around the image within the frame to give a window. The image is coloured in with Copic markers and then mounted on some acetate. I used the stripes embossing folder from Stampin Up and real red card stock for the surround. The shaker is filled with little silver stars from Lucys' Little Things. I added some detail onto the the number plate and then mounted the whole thing onto a white card base. 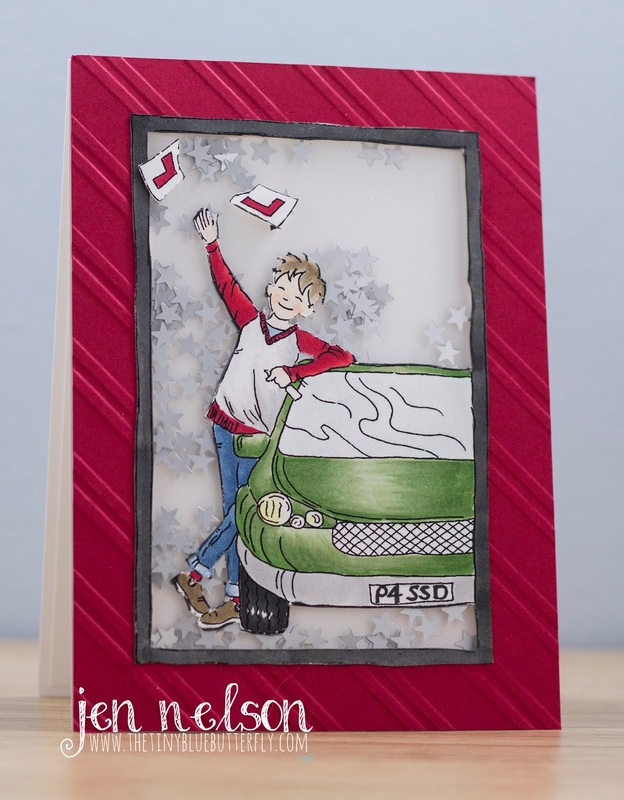 This card has a little more than what I normally add but its fun making shaker cards once in a while and I loved the idea of him throwing the learner plates in the air!